I’m enjoying my summer. I’ve been trying to chill. Trying. It’s admittedly not always my nature. One of the many things I am enjoying is that I’ve been making ice cream or sorbet this summer at least 2-3 times a week. Earlier in the week I made French Vanilla to go with peach pie and night before last I prepared a lovely Honey Peach Ice Cream inspired by Dorie Greenspan and served it with French Butter Cookies. Week before last, I prepared 2 kinds of berry sorbets and a wacky Sweet Corn Ice Cream that I served with a Blueberry Tart. There’s also this fantastic ice cream shop where I am visiting this summer, Herrell’s that serves Burnt Sugar and Butter ice cream that’s so amazing it almost makes you want to roll around in it. They also make a Dutch Chocolate with Orange that is positively sublime. When you marry the two it’s just really kind of ridiculous, if not obscene. One reason is that I am playing with an awesome vintage fancy Italian ice cream maker by the company Ugolini with a built in compressor. It makes chilled concoctions and confections in a cool 30 minutes. No bowls or disks to freeze, no hand-churning. It’s another stylish and smart Italian accessory. Got to love it. I did a little research and it seems that one of the best on the market with similar technology – that’s more readily available than ebay – is the Cuisinart Supreme. Cuisinart products are excellent, so I am sure it’s fantastic. It seems we are not the only ones. 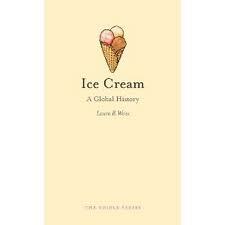 I’ve also been enjoying reading a very stylish and smart book titled Ice Cream: A Global History by my friend and colleague Laura Weiss. Tight, informative, and well written, Laura’s book been very well received with great reviews by many, including Publisher’s Weekly and the Boston Globe. The book is perfect read for professional chefs, informed foodies, and culinary historians — as well as curious ice cream lovers. Laura deftly tells the sweet story of one of the world’s favorite foods and this book is right up my alley. She starts with the premise that everyone loves ice cream. So far, so good, right!? The book then explores the “early ice cream age.” Centuries ago, ice was hauled down from the mountains and stored in ice houses, then sweetened to create “sherbets” for ancient Persian rulers. That’s when all this sweet bliss started. Heck, it’s hot over there, right? She then tells the tale of ice cream in the colonies, the “golden age” of ice cream, our forefathers enjoying ice cream in the colonies; the advent of novelties such as cones and popsicles; mass market ice cream, and essentially, how those simple Persian ices and sherbets evolved into the sorbets and and ice creams available today. It’s one of those things we can just take for granted — there’s ice cream sold at the jiffy mart. It’s cold and tastes good. But there’s something behind all that. Think about ice cream when ice was in the Alps, not in your kitchen. See? Frankly, I think the history of ice cream is fantastic and nothing less than the culinary mastery of time and temperature. It’s a book you want to read. There’s a selection of both historical and modern recipes and includes a simple raspberry smash from Hannah Glasse to a more exotic Roquefort and Honey Ice Cream from David Lebovitz. It’s been an inspiring tale. Most of my ice creams thus far have been some sort of version of a crème anglaise. You can play with the dairy — ice cream made with cream is richer and fattier than ice cream made with milk. Milk can be whole or low fat. Too much fat and the ice cream is heavy, too little and it’s too icy. For me it depends on the flavor. The corn ice cream seemed to benefit from the fat whereas my peach ice cream is light and clean. The amount of eggs can also effect the viscosity. Creating flavors has been a lot fun. 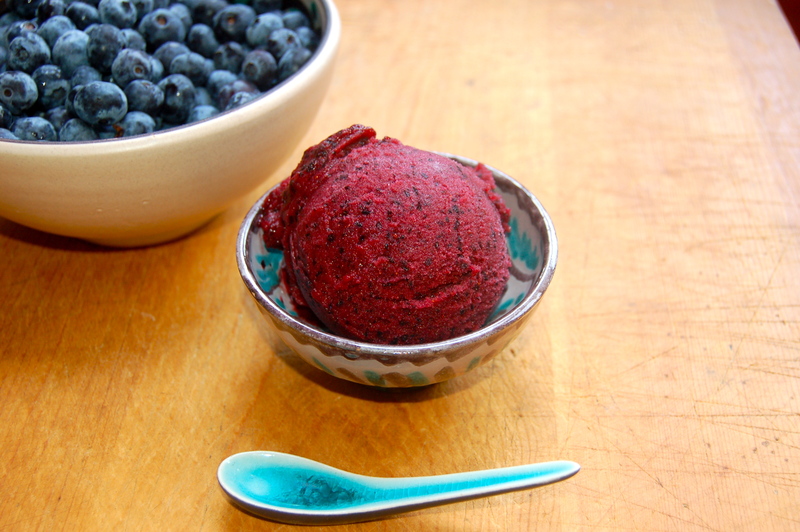 The sorbet formula is perfect – 4 cups fruit to 1 cup simple syrup. No fat, no worrying about curdling a creme anglaise, just press “puree.” Sure, some have been better than others but seriously, how bad can homemade ice cream or sorbet be? My friend was moaning, “Summer is almost over!” No way. I’m dragging my heels. I’m savoring every satisfying bite and making it last. Here are a few recipes for ice cream so you can, too! Let me know what you think — and send me pics! I’ll feature them in the blog post next week. Make an ice bath by filling a large bowl halfway with ice cubes and water. Set aside. Place the cocoa powder and 1 cup of the cream into a medium saucepan over medium heat and whisk to combine. Add the milk and remaining heavy cream. Bring the mixture just to a simmer, stirring occasionally, and remove from the heat. In a medium mixing bowl whisk the egg yolks until they lighten in color. Gradually add the sugar and whisk to combine. Temper the cream mixture into the eggs and sugar by gradually adding small amounts, until about 1/3 of the cream mixture has been added. Pour in the remainder and return the entire mixture to the saucepan and place over low heat. Continue stirring the custard until thick enough to coat the back of the spoon and the mixture reaches 180°F on an instant-read thermometer. Remove from the heat. Set a sieve over a large, clean bowl and pass the custard through the sieve. Discard any eggy solids. Add vanilla extract, orange extract, and salt. Stir to combine. Cool mixture completely over an ice bath or refrigerate until cool. Churn the ice cream according to the machine instructions. Make an ice bath by filling a large bowl halfway with ice cubes and water. 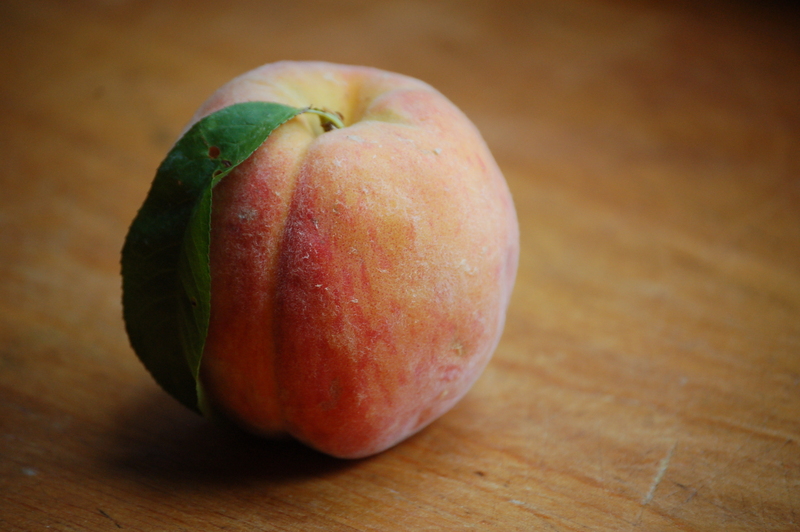 Place the peaches and honey in the jar of a blender. Puree until smooth. Set aside. In a saucepan, bring the milk almost to a boil over medium heat. Add the scraped vanilla bean. In a second saucepan, blend together the egg yolks, sugar, and salt with a wooden spoon until thick and light (be careful not to make the mixture foamy). Mix in half the hot milk, then transfer the mixture to the other saucepan with the remaining milk and blend. Decrease the heat to low and simmer gently, stirring constantly with a wooden spoon. Continue stirring the custard until thick enough to coat the back of the spoon and the mixture reaches 180°F on an instant-read thermometer. Remove from the heat. Set a sieve over a large, clean bowl and pass the custard through the sieve. Discard any eggy solids. Add peach puree and stir to combine. Cool custard completely over an ice bath or refrigerate until cool. Churn the ice cream according to the machine instructions. Make an ice bath by filling a large bowl halfway with ice cubes and water. 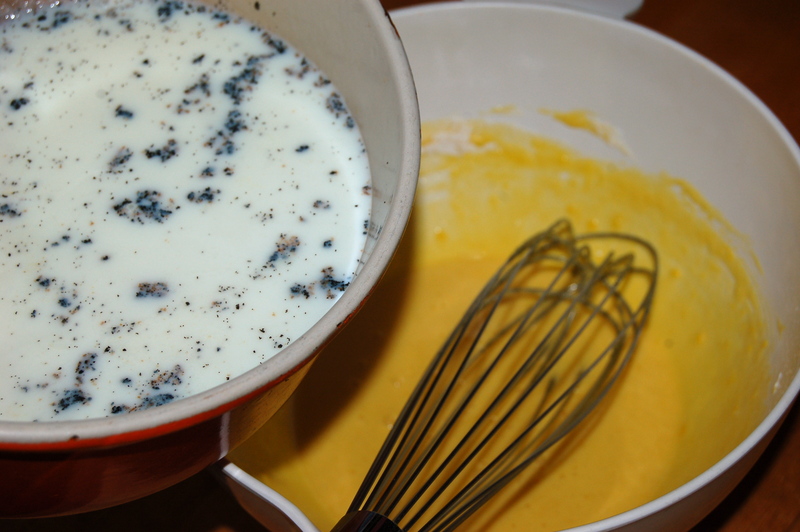 Place the half-and-half and the heavy cream into a medium saucepan, over medium heat. Bring the mixture just to a simmer, stirring occasionally, and remove from the heat. In a medium mixing bowl whisk the egg yolks until they lighten in color. Gradually add the sugar and whisk to combine. Temper the cream mixture into the eggs and sugar by gradually adding small amounts, until about a third of the cream mixture has been added. Pour in the remainder and return the entire mixture to the saucepan and place over low heat. Continue stirring the custard until thick enough to coat the back of the spoon and the mixture reaches 180°F on an instant-read thermometer. Remove from the heat. Pour into a large clean bowl. Cool completely over an ice bath or refrigerate until cool. Churn the ice cream according to the machine instructions. Make an ice bath by filling a large bowl halfway with ice cubes and water. Set aside. Heat the water in a small saucepan over high heat to boiling. Add sugar and stir to dissolve. Add lemon verbena. Remove from the heat and let steep until tepid, about 15 minutes. 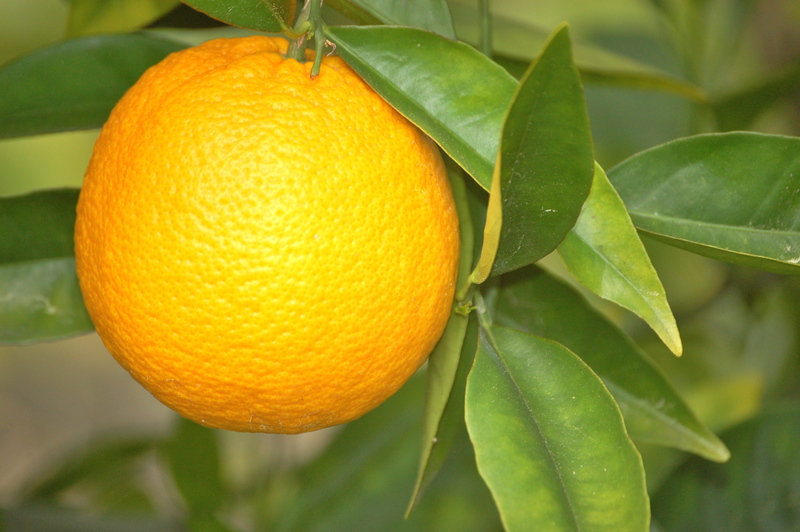 Remove the lemon verbena and discard. Place the berries in the jar of a blender. Pour over the simple syrup and add the salt. Puree until smooth. Cool completely over an ice bath or refrigerate until cool. Churn the sorbet according to the machine instructions. Make an ice bath by filling a large bowl halfway with ice cubes and water. Set aside. In a saucepan, bring the heavy cream and milk almost to a boil over medium heat. Meanwhile, in a medium mixing bowl whisk the egg yolks until they lighten in color. Gradually add the sugar and whisk to combine. Temper the cream mixture into the eggs and sugar by gradually adding small amounts, until about a third of the cream mixture has been added. Pour in the remainder and return the entire mixture to the saucepan and place over low heat. Continue stirring the custard until thick enough to coat the back of the spoon and the mixture reaches 180°F on an instant-read thermometer. Remove from the heat. Set a sieve over a large, clean bowl and pass the custard through the sieve. Discard any eggy solids. 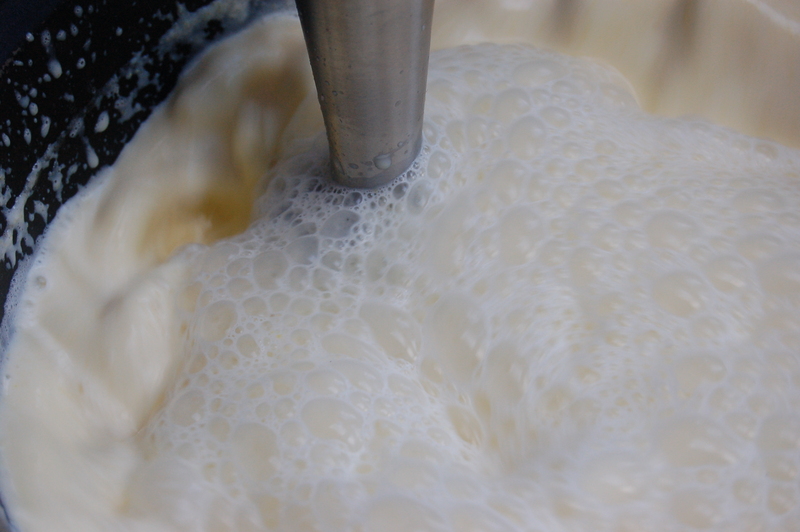 Whisk together the corn syrup and goat cheese and then whisk this mixture into the cream mixture until smooth. Cool mixture completely over an ice bath or refrigerate until cool. Churn the ice cream according to the machine instructions. 12 Responses to Two Scoops? No, FIVE Ice Cream Recipes! Souffles last week, ice cream this week. All those folks with backyard chickens must be loving you. Hi Virginia – great post as usual! I’m very interested in the Goat Cheese Ice Cream – Is there something missing before the ‘Make an ice bath’ paragraph? Virigina, the Bourbon vanilla ice cream sounds awesome. I have never made ice cream before and yours might be the first recipe I try! Goat cheese ice cream! Love. Will have to try. Ok now you’ve done it. Been meaning to do something with all these figs – believe i’d better make some ice cream with them!!! How can I resist this? goat cheese ice cream! How absolutely wonderful! Thanks for sharing this.